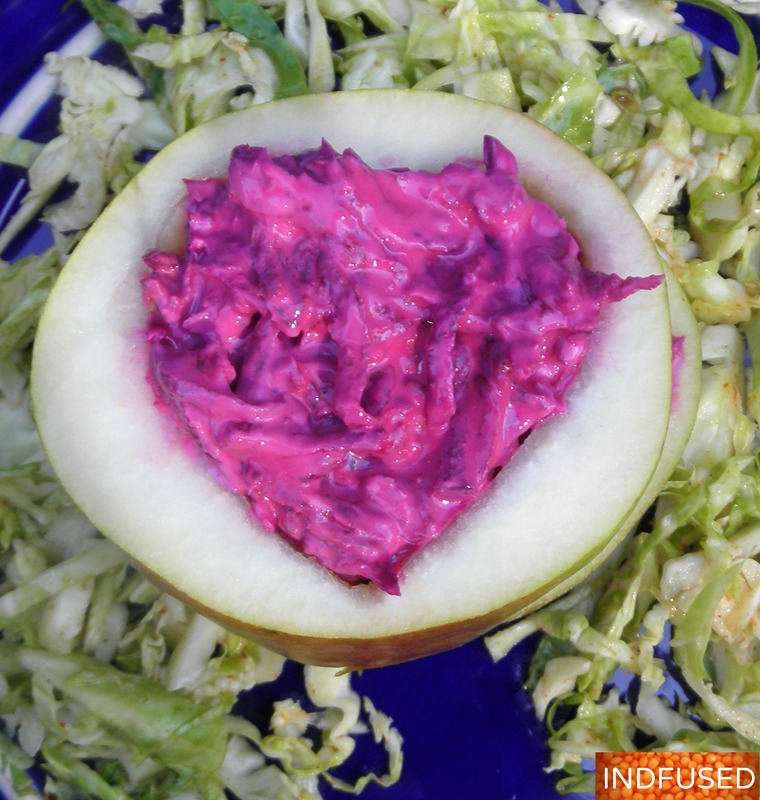 They say marriage is a compromise 🙂 My husband loves this beet koshimbir and I love pear raita so putting this together, each of us got what we love…….wish all other compromises were this easy, right? 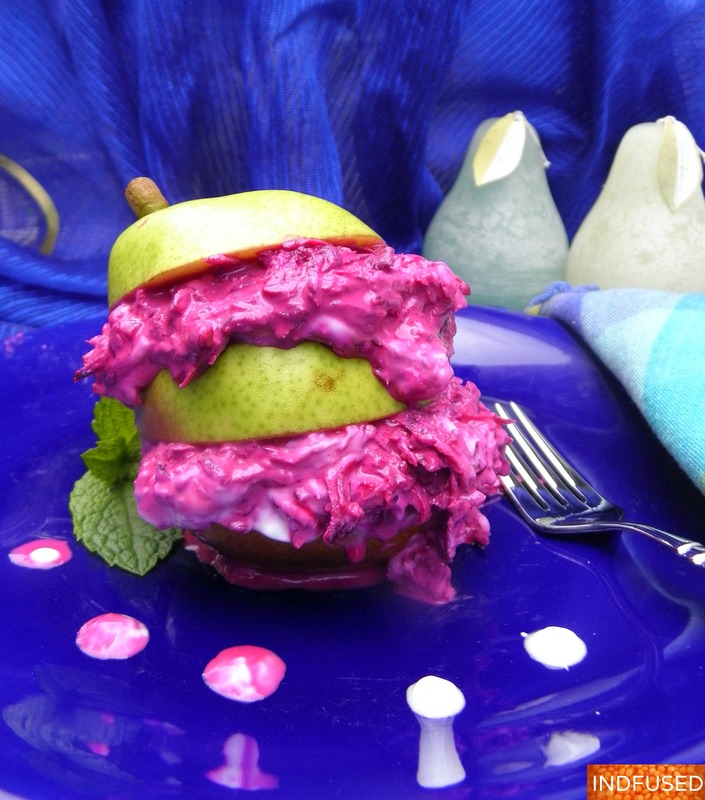 I saw a picture of a pear salad on Pinterest and loved the presentation. That is where the idea of assembling my beet and pear koshimbir came from. My presentation looks messy though with the yogurt ‘sauce’ in the koshimbir, but I assure you it tastes awesome! Plus I also blamed the pear, which was squatty and a little lop sided. But I did not have a good looking ripe pear so I had to use this one. This is an easy to put together salad…oh by the way…koshimbir in Marathi is a salad. This is a nice and cooling salad for hot summer days! The beetroot koshimbir can be made in advance and refrigerated. The pear assembly was done before serving. It is fun for everyone to assemble their own pear too. Prick the peeled beetroots with a fork and microwave on high, for one minute. Remove from microwave and when cool enough to handle, grate the beets on a coarse grater. In a small frying pan, over medium heat, add the ghee, cumin seeds and the serrano pepper slices. When the cumin seeds start to splutter and give off their aroma, turn off the heat. Add this tempering to the grated beets. Add the yogurt, sugar and sea salt and toss well to combine the koshimbir. Cut the pears in three slices horizontally. Scoop out the core. I used a cookie cutter to cut the centers. Brush cut sides of the pear with lemon juice. Assemble the koshimbir. Repeat with the other pear and serve! Enjoy the cool koshimbir! I am joining the Fiesta Friday at Angie’s co- hosted this week by Julie and Josette. Come check out the amazing array of foods there! Sandhya, the color is amazing and it sounds delicious. Thanks Suzanne! Really appreciate the kind words. Thank you so much for your kind words! The pear tastes really good with this koshimbir! What a gorgeous recipe! Marriage is a compromise, but I love being married too. Very sweet to show your husband that your recipe was a compromise with his likes taken in to consideration. Enjoy your weekend! You are a pro !I learn so much from your awesome blog.